For years, any adult who wanted to straighten their teeth felt like they couldn’t because their only choice was metal braces. They simply couldn’t imagine going to work or hanging out with friends with a mouthful of metal. With Invisalign, however, now they don’t have to. Designed to be discreet and extremely comfortable, this treatment is perfect for older patients who are looking to improve the health, appearance, and function of their smile all at the same time. Why Choose Beach Dental for Invisalign? 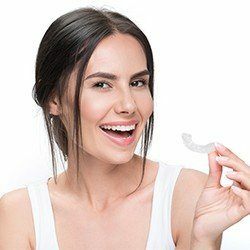 The key to Invisalign is that instead of metal brackets and wires, a patient simply has to wear a series of lightweight, clear plastic aligners that slip easily over the teeth. Each one will be shaped to slowly bring the smile into its ideal orientation, and a patient will be able to notice results at each step of the process. After wearing every aligner in the series for about 2 weeks for 20-22 hours a day, a patient will see a perfectly straight set of teeth in the mirror. 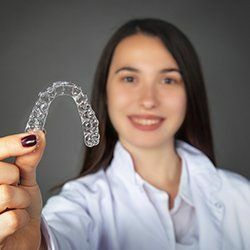 Practically Invisible: The aligners are designed to look like they aren’t even their when worn, ensuring patients can speak and smile with complete confidence throughout their treatment. Comfortable: Every patients’ aligners are shaped using a 3D scan of their mouth, ensuring the smooth plastic fits perfectly among the lips and gums. Convenient: Whenever it’s time to eat or brush your teeth, you can simply take Invisalign off until you’re done. This way, you can maintain your normal life while getting the smile you’ve always wanted. Fast: While regular braces usually take about 2-3 years to finish treatment, Invisalign can often straighten the teeth in just 12-18 months. 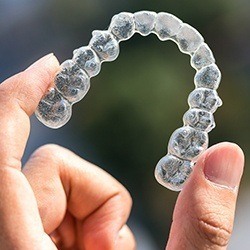 If you’re interested in getting Invisalign, the process couldn’t be simpler. Just give Beach Dental a call, and we’ll schedule a consultation right away. We’ll perform a quick exam, and if Invisalign would be a good fit for you, we’ll begin designing your aligners at the same appointment! Before you know it, you’ll have a beautifully straight set of teeth you’ll be able to enjoy for the rest of your life. 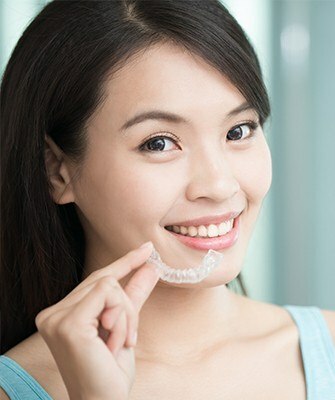 To begin your journey to a straighter smile with Invisalign, contact us today.